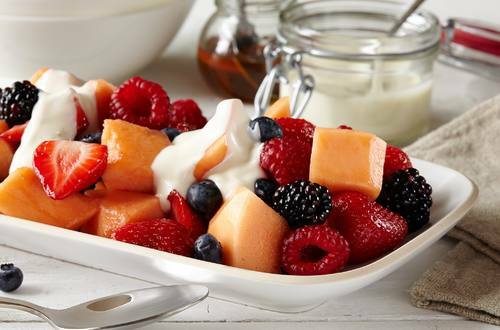 Fresh fruit mixed together with Hellmann's® Real Mayonnaise makes this juicy fruit salad a perfect colorful dessert. A great summer recipe. 1 Blend Hellmann's® or Best Foods® Real Mayonnaise, sour cream, honey, lime juice and grated lime peel in medium bowl. Chill, if desired. 2 To serve, divide fruit mixture between 4 serving dishes, then dollop dressing. Drizzle, if desired, with additional honey.